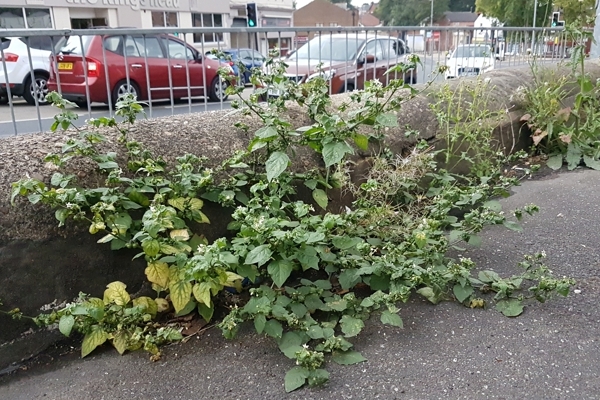 In the centre of Hemsworth, I spotted some black berries on a plant growing in a car-park. 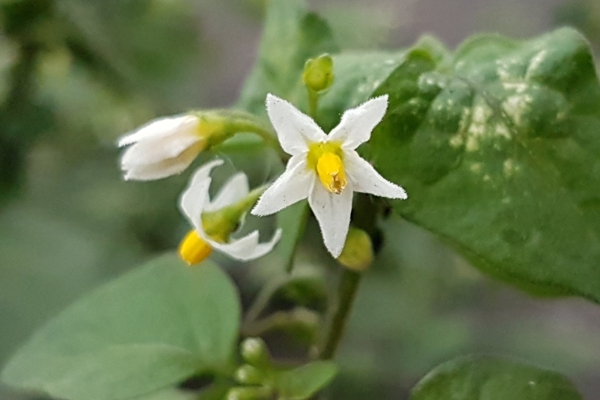 I then noticed the small white flowers, which were obviously those of a Solanum – the group of plants that includes potatoes and tomatoes. 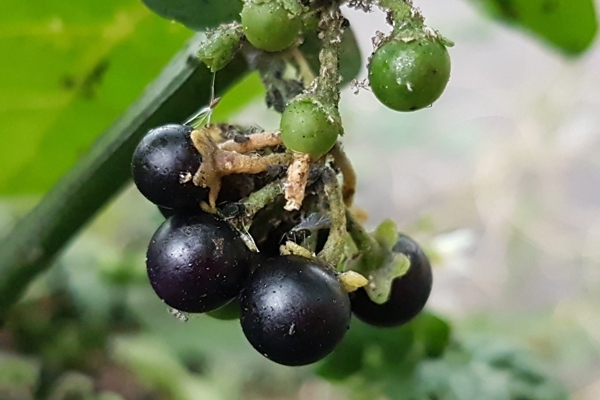 The commonest Solanum is woody nightshade (Solanum dulcamara) and I am very familiar with the purple flowers and red berries of that plant but this plant was obviously something new to me. Checking a field guide later, I found that this plant was black nightshade (Solanum nigrum). This particular Solanum occurs in many countries throughout the world and the chemicals that it contains lead to the plant having many medicinal uses. I can’t recall seeing black nightshade previously. By looking at a distribution map, I found that our part of Yorkshire is at the top end of its main English range, so I wouldn’t expect it to be as uniformly distributed and common here as it is in some parts of the south and east. Also, one article that I found suggested that the berries ripen only if there is suffcient sunshine, as there has been this year. Perhaps our usual weather does not allow this plant to fruit well in our area in normal years. I like finding new things in this way: in a built-up area, close to home. This shows that you don’t need to travel to nature reserves to make discoveries. In these continuing dry conditions, there are still relatively few fungi around but it is still worth spending some time searching. A week ago, I spotted a large and conspicuous white fungus on a tree-stump at Nostell Priory. 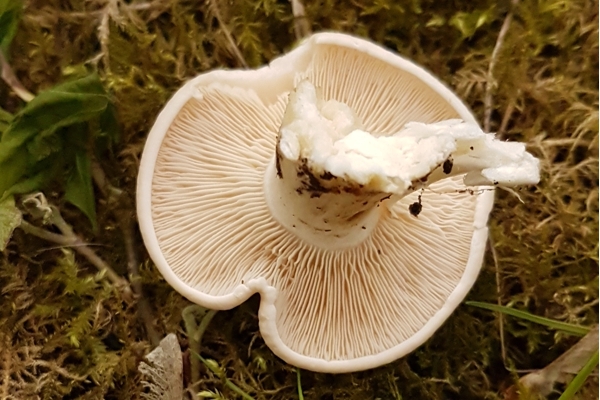 On closer examination, I found it to be Volvariella bombycina, which goes by the common name of silky rosegill. This is an uncommon species, so it was pleasing to find it growing in our area. The scientific name of this species refers to the bag-like volva from which the fungus emerges. The remnats of this can be seen at the base of the stem. The common name refers to the texture of the cap. 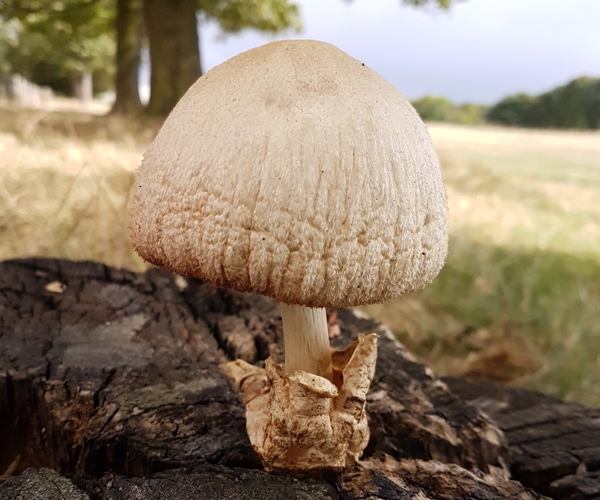 The very dry conditions created by this summer’s hot weather don’t give much promise for a strong start to the fungus season. However, two of us went out to search several local sites last week in the hope of finding one or two species on trees, for which moisture would not be the problem that it is for those species that grow on the gound. 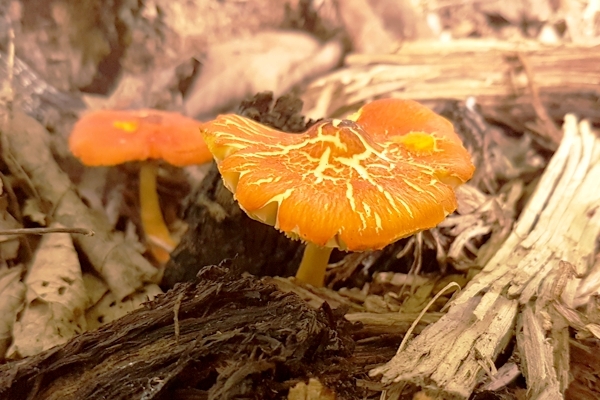 We were searching a pile of rotting timber, on which there is usually something to be found, when we spotted some bright orange caps beneath a covering of dried grass. The mushrooms were growing on a well rotted sycamore stump. 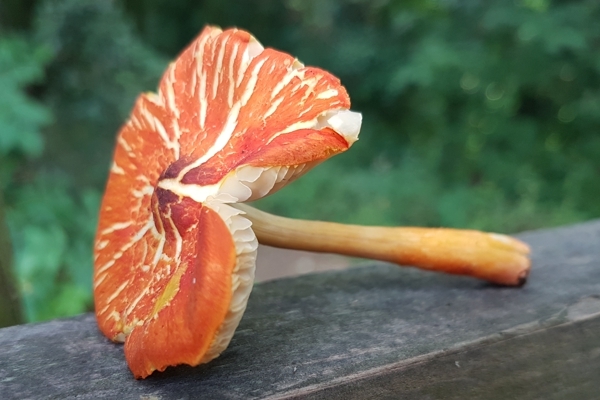 There aren’t many mushrooms that are such a bright orange colour and this one took a little while to identify. 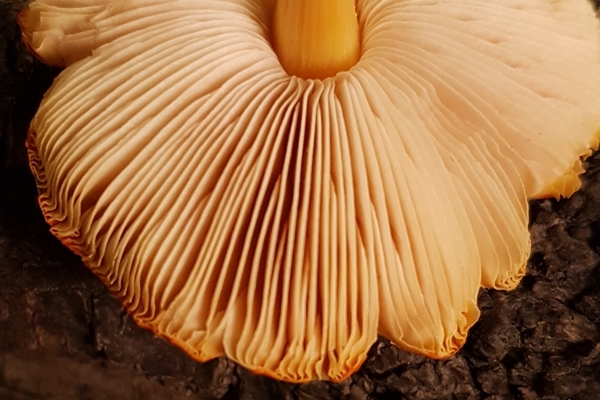 The splitting of the cap, caused by the dry conditions, almost led us in the wrong direction but the mushroom was found to be Pluteus aurantiorugosus. 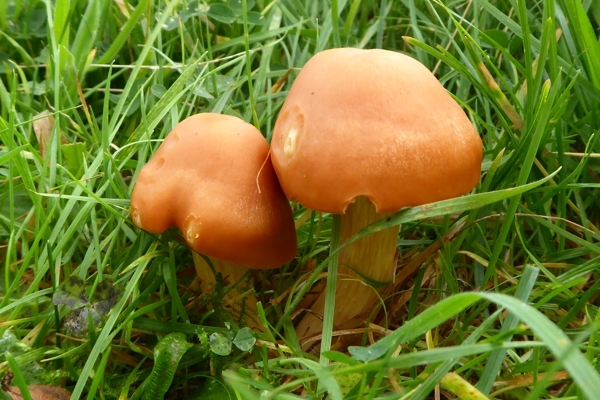 This species is not common and the CATE databse, operated by the Fungus Conservation Trust, contains no previous records for Yorkshire. It was Swift Awareness Week last week. Work was a bit busy then but, a week later, I have finally put up two swift nestboxes that I was prevented from putting in place earlier in the year. 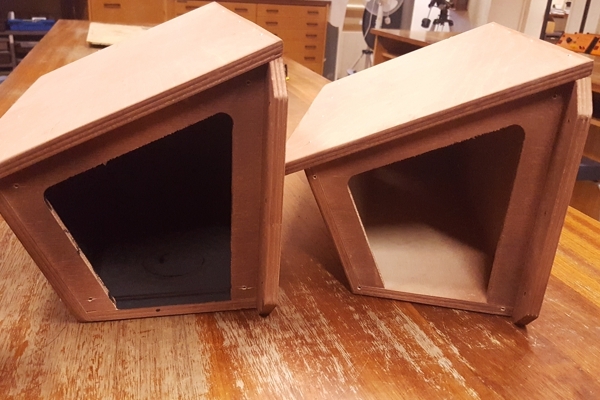 By doing a little research, I found that swifts are more likely to use a box if the interior is dark, so I painted the insides of my two new boxes black. The effect of painting the interior. It did not seem right to expect swifts to lay eggs on a perfectly flat surface, so I created a nest concave for each box. The simplest way that I could think of to do this was to cut a set of circles of decreasing size in pieces of card and glue these together. 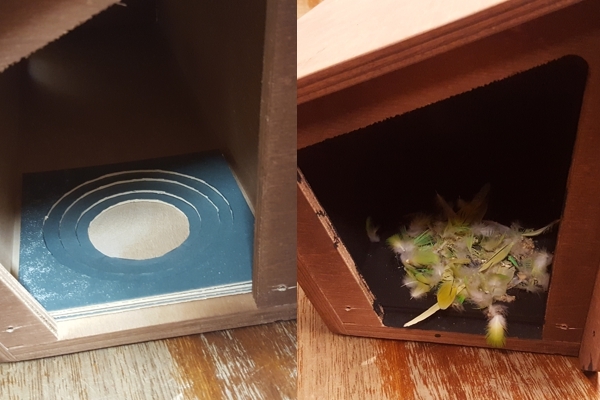 I also thought the birds might prefer a box that looks a little lived-in, so I glued a few feathers, from our budgerigars, into the concave. 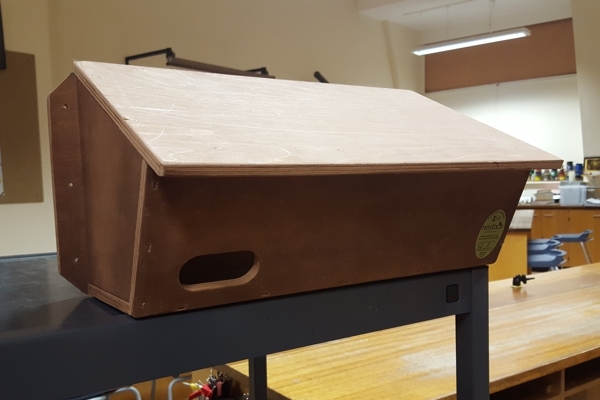 The main way to increase the probability that the boxes will be used is to play the calls of swifts to attract them to the boxes. 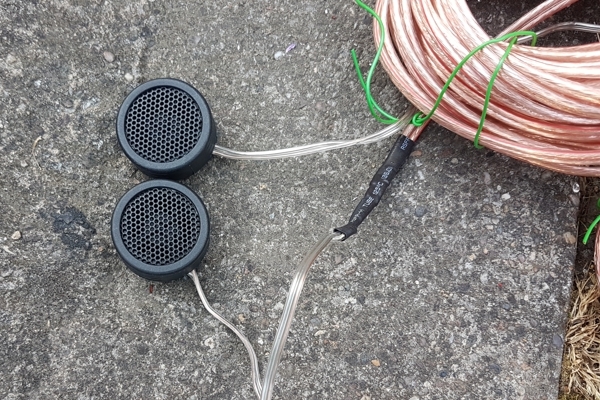 To do this, I bought a couple of small speakers, or tweeters, and a small, cheap amplifier unit. the tweeters are attached to the boxes and the amplifier is in the house. This set-up plays swift calls from an SD card and is turned on and off using a timer plug. Finally, I placed the boxes below the eaves of the house. 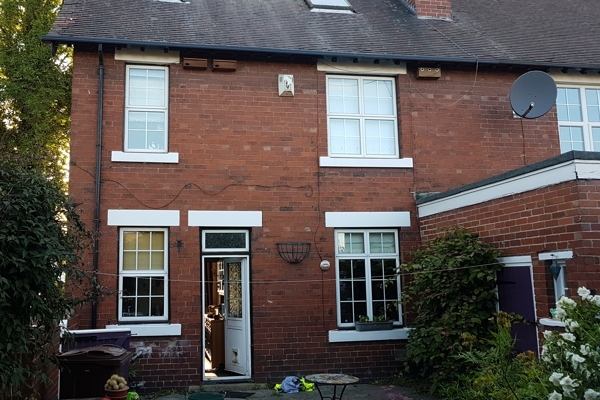 Swift boxes (left) and house sparrow boxes (right). I have missed this year’s breeding season but I hope that some swifts will have a look at the boxes before they return to Africa for the winter. 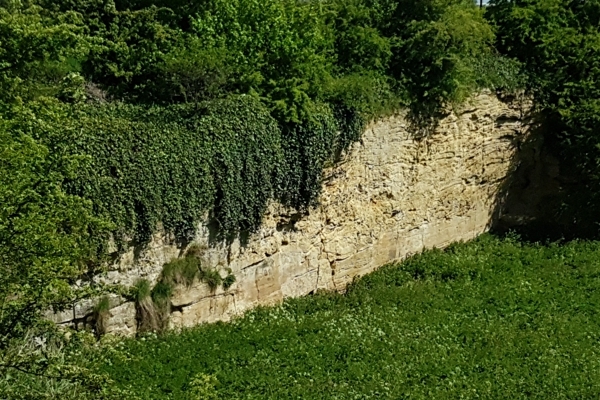 Following a fruitless trip to search for adders yesterday, three of us decided to visit a particularly interesting quarry at S Elmsall. 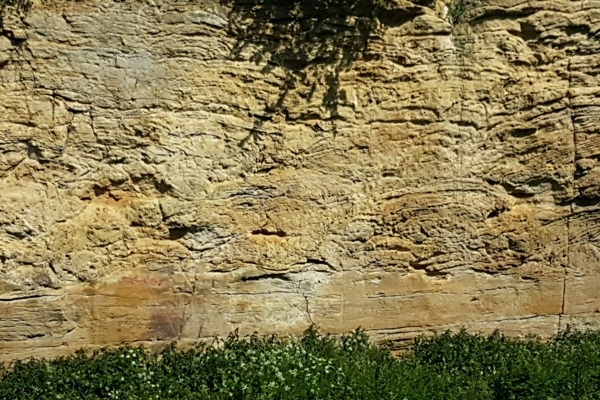 The quarry is a Site of Special Scientific Interest because of some shapes that can be seen in the wall of the quarry. These shapes are the remains of ancient structures called stromatolites. Stromatolites are of interest because they provide the earliest signs of life on Earth, with some of the traces in the fossil record being 3.5 billion years old.My knowlege of geology is superficial but what follows is my understanding of what can be seen in the quarry. Stromatolites develop very slowly in shallow and highly saline water and they look like boulders. They are created by mats of single-celled organisms, such as cyanobacteria or algae. 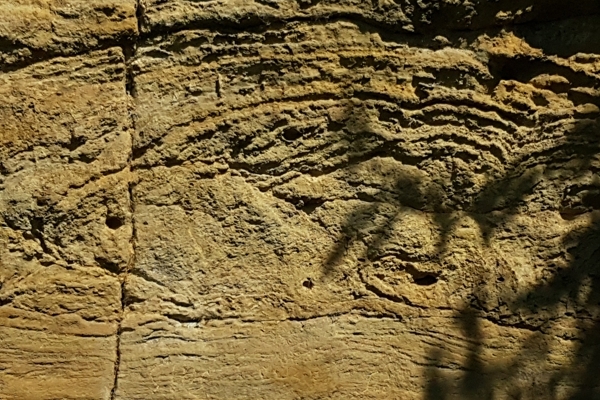 Mineral particles trapped by the organisms gradually build up in layers to form the stromatolite. 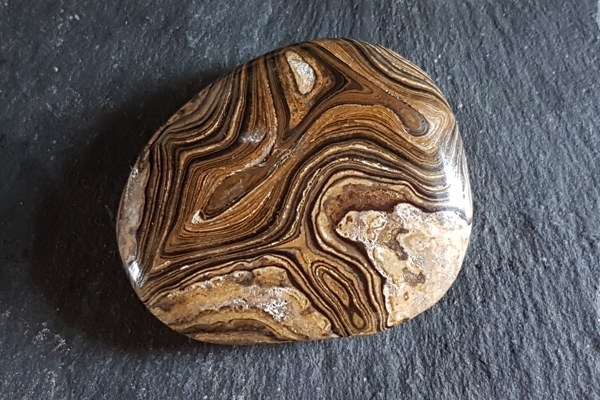 Follow this link if you would like to see modern stromatolites. Click here to see modern stromatolites. The following photograph shows a small piece of fossilised stromatolite and it has been polished to reveal the layers. In the wall of the quarry, there is a clear horizontal boundary. Below this line, there is a layer of grainstones. Above the line, there are the fossilised remains of a reef and within that zone. You can see domed shapes that are the fossilised remains of stromatolites. The remains date from the late Permian period, making them more than 250 million years old. Note: Please do not eat any mushrooms that you collect from the wild as a result of anything that you read on this page. 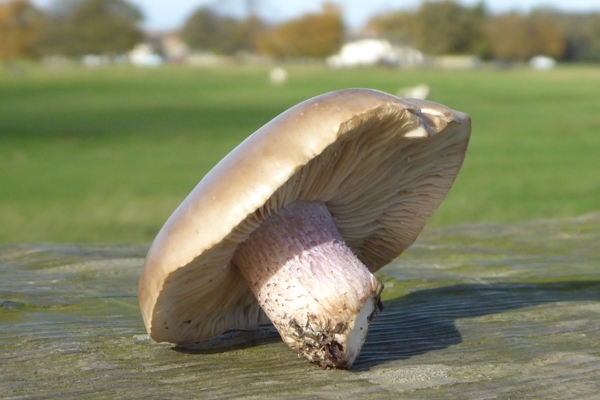 You should not eat wild-collected fungi unless they are identified for you by an expert. 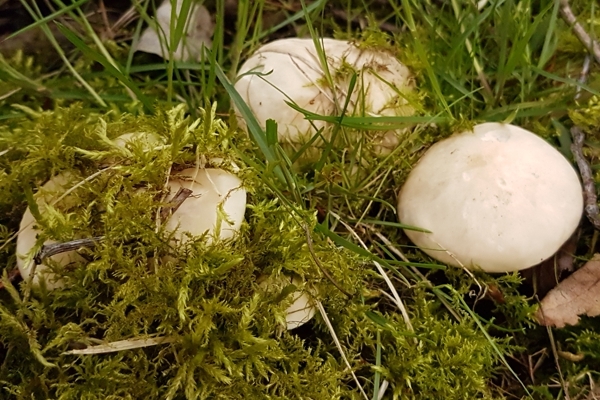 Spring isn’t the time when most people would think of searching for mushrooms but there are one or two species to be found. 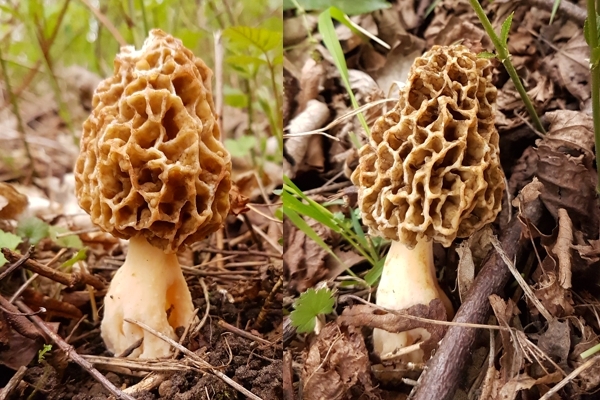 A real prize for foragers is to find morels. These are amongst the most delicious of all mushrooms but they are not at all common in Great Britain. They are ascomycetes, so they do not have quite the same structure as many of the more familiar mushrooms. They are said, by some, to prefer to grow alongside woodland rides and on woodland edges, on the drip-line of trees. These two were amongst a small group growing on the grassy edge of a wide path through woodland. 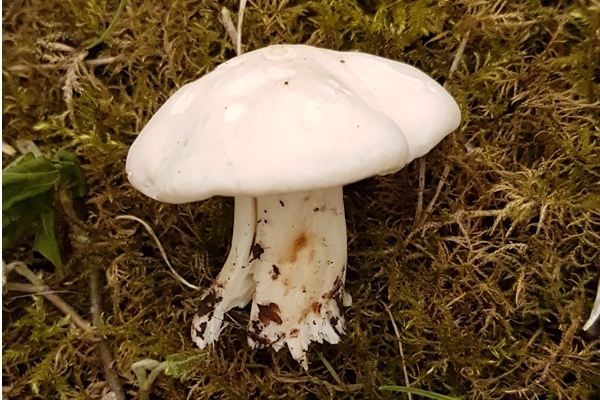 Another one to watch for at this time of year is St George’s mushroom, which grows from about the time of St George’s day onwards, until around June. These resemble the edible mushrooms that you can buy in the supermarket (Agaricus bisporus) and the common field mushroom (Agaricus arvensis) but they belong to a different genus, Calocybe. An obvious difference is that they have white gills. Also, they have a distinctive mealy smell, similar to the smell of damp flour. They are popular for eating in some European countries. 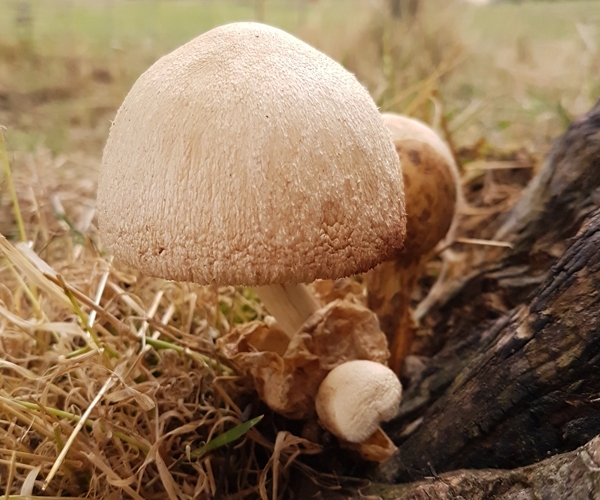 The ones that I found were on a reclaimed colliery site, growing beneath trees. The main part of fungi that grow on the ground is an underground network of very thin threads called the mycelium. Many fungi are mycorrhizal, which means that the mycelium has a relationship with the roots of a particular plant. You will find the fungus growing near only those trees or plants with which it can form this relationship. The St George’s mushroms that I found were growing in a ring and this indicates that this fungus is proabably not mycorrhizal. Instead, it is probably saprobic, which means that it feeds on dead organic material in the soil. The mycelium gradually spreads outwards, over the years, as it feeds. We are well into the winter but there are still some interesting fungi to be found. Common candlesnuff is easy to spot on decaying treestumps and smaller pieces of dead wood. However, if you want more of a challenge, you can watch out for beechmast candlesnuff, which grows only on the seed cases of beech trees. 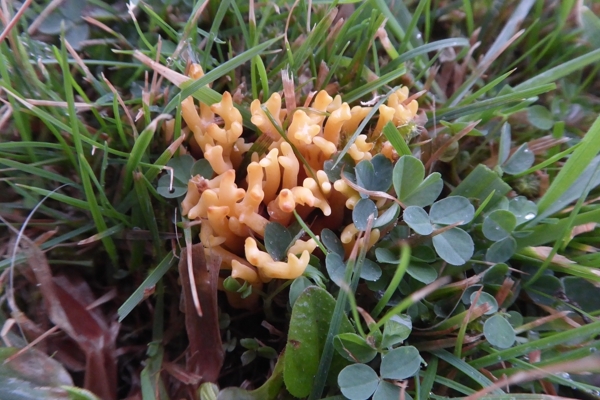 To find beechmast candlesnuff, you may have to turn over the fallen leaves to get to the beechmast that is in the correct, damp condition for the fungus. 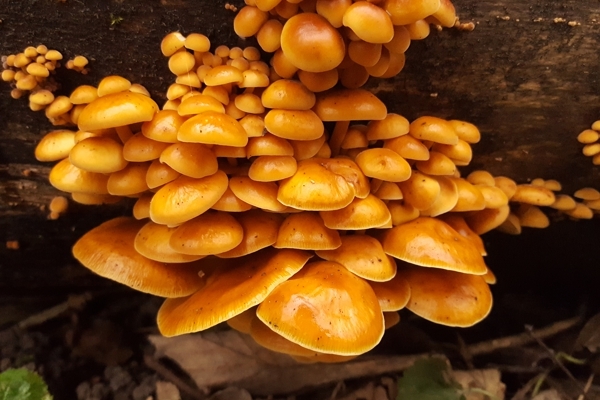 Another common winter fungus is velvet shank. 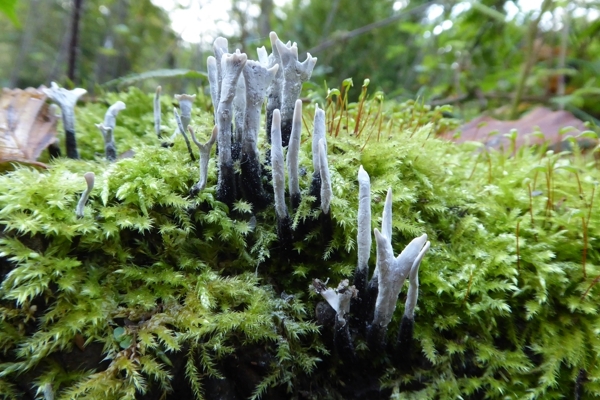 This fungus has a slimy cap and is often seen sprouting from logs. A much less common fungus that appears about now is scarlet elfcup. 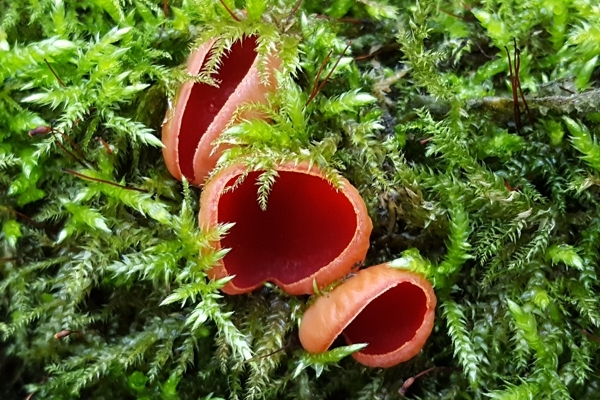 To find scarlet elfcup, look for mossy logs or smaller pieces of decaying wood on mossy ground. 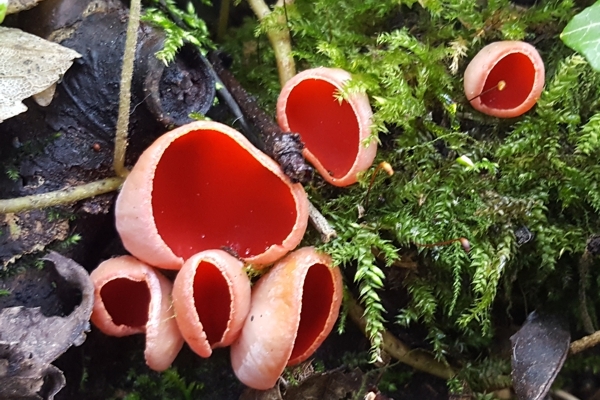 If you are lucky enough to find a red, cup-shaped fungus, you can’t be certain about the id without using a microscope because scarlet elfcup is almost identical to ruby elfcup. One feature used to tell the two apart is the microscopic hair on the underside of the cup. For scarlet elfcup this hair is twisted and tangled but it is straighter for ruby elfcup. 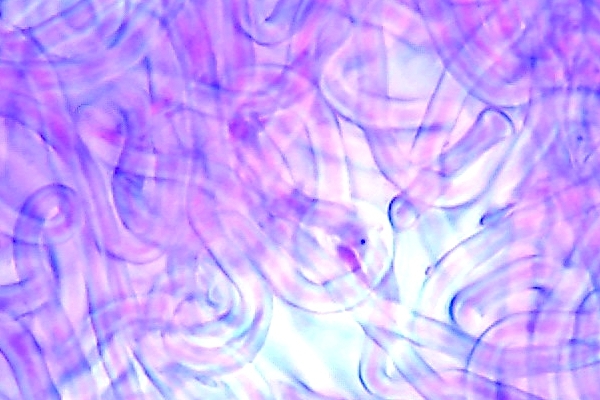 This microscope image shows the hairs on one of the specimens in one of the images above. 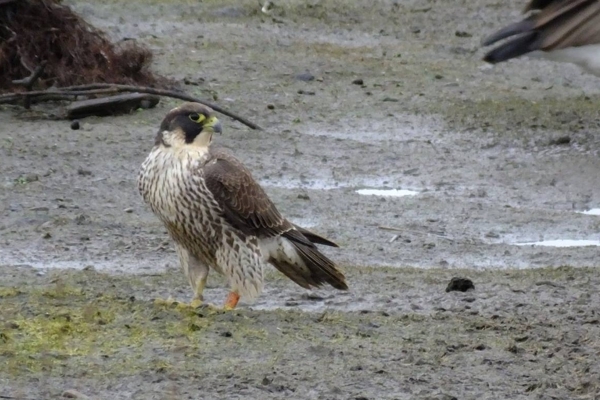 Exciting news in recent weeks has been the identification of a peregrine that has taken up residence at RSPB Old Moor as PAA – a female from this year’s Wakefield Cathedral brood. Young peregrines don’t breed until two or three years of age and they can travel great distances during that time. PAA hasn’t moved a huge distance from Wakefield but she hasn’t needed to. She has found a great site, with plenty of available food, on which to spend to the winter. 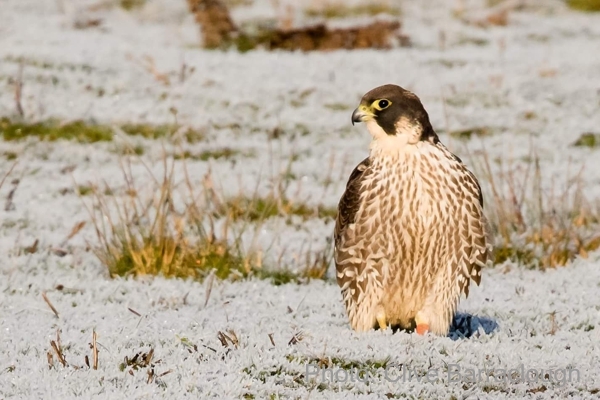 It is normal for peregrines to settle on a suitable location in which to get through the difficult months of winter. 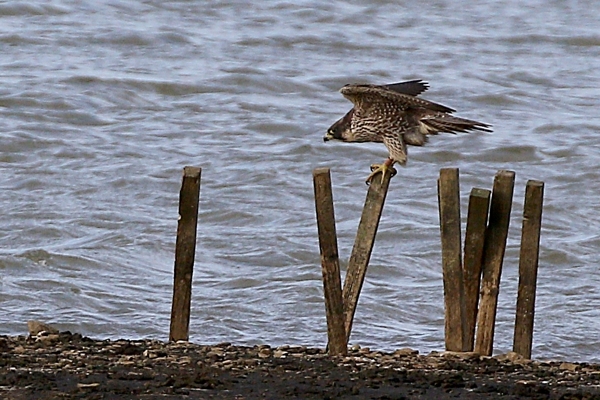 PAA spends much of her time sitting on pylons which overlook the reserve. She comes down to the lakes frequently to catch prey and she spends a significant time on islands which can be seen from the Family Hide and the Wader Scrape Hide. She feeds on the islands, she bathes on the water’s edge and she spends long periods sitting on posts on one particular island. She seems to have a fondness for moorhen but she has also been seen to take common gull and golden plover. As well as entertaining the human visitors to the reserve, PAA has made her presence known to the avian visitors. She has been seen to bully and chase away a marsh harrier, buzzards and sparrowhawks. Also, her menacing presence on the pylons has probably been the reason why the starling murmuration has not got going this year. The starlings would normally settle on the pylons before murmurating. It’s great to see one of Wakefields young peregrines thriving and we hope to hear more news of it in the future when it reaches breeding age. One of the things that I have learnt in recent months is that a great place to look for interesting fungi in late autumn is amongst the moss in patches of grass which have not been pampered for many years. Neglected lawns, the outfields of cricket grounds and the mossy grass amongst the graves in churchyards provide a great habitat for some interesting species. meadow coral is a common species but you have to look closely to find it. 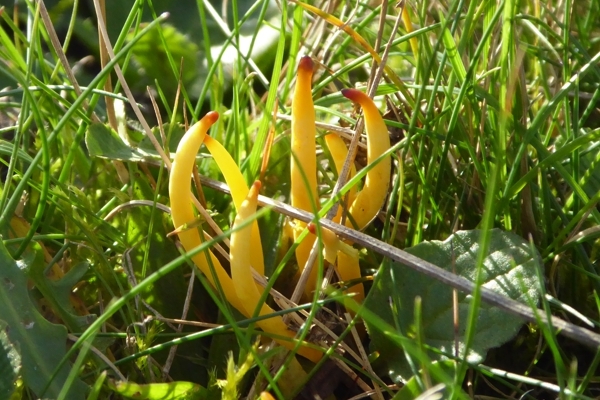 You should also see the yellow tongues of other Clavulinopsis species. A microscope is needed to identify these positively at the species level. 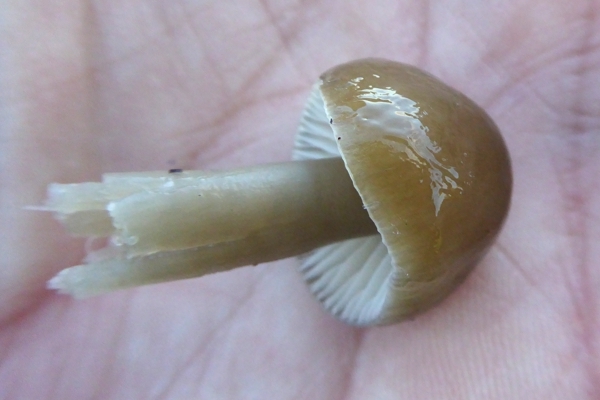 An interesting capped mushroom is the common powdercap. This species can be very small but it is attractive. 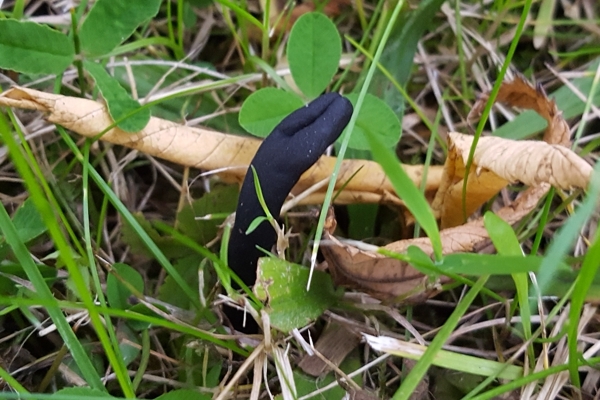 It is also host to a rare mushroom called the powdercap strangler. You would be very lucky to find this but you should google it to learn more about it. 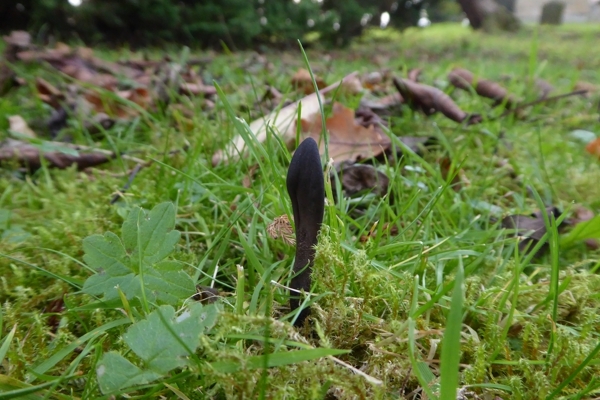 Earth tongues are always of interest to enthusiasts and they can turn up anywhere where there is mossy grass. The commonest is Geoglossum cookeanum, which I found by a main road in the centre of Ackworth, and the one which is next is G fallax, which I found in a north Leeds churchyard. These two earth tongues have been positively identified by looking at their spores under a microscope. 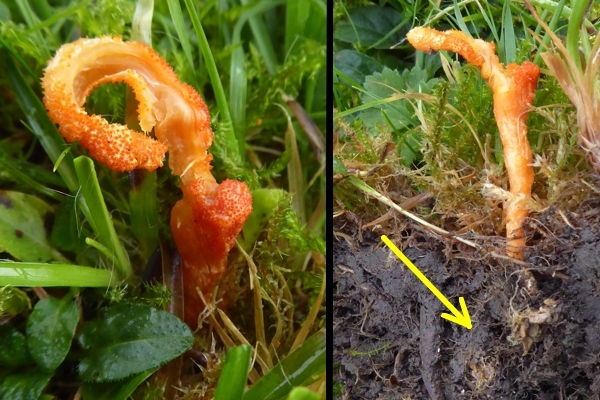 An exciting find for me recently was caterpillar club fungus, which I spotted in another churchyard in north Leeds. 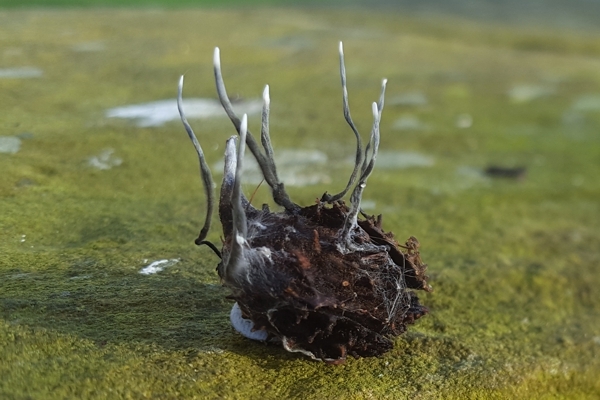 This fungus infects the larva of a moth, beetle or other insect which has pupated underground. The yellow arrow indicates the remains of the pupa. This fungus is cultivated in the far east, where it is used in traditional medicines. Colin Booker and I had a look on Heath common yesterday to see if there were any interesting fungi. 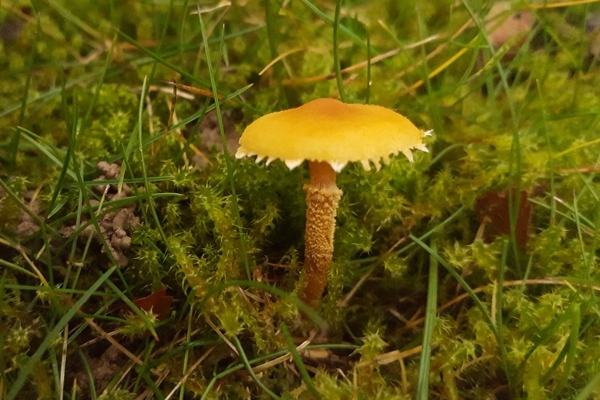 As we had hoped, we started finding colourful waxcaps almost immediately. 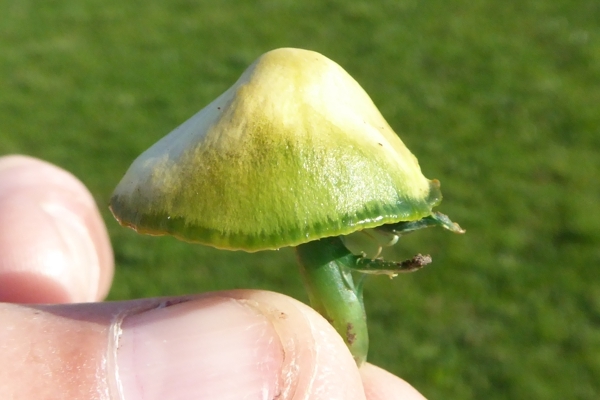 Some waxcaps are indistinguishable without the use of a microscope but a few are quite recognisable, such as the parrot waxcap, which comes in a range of colours but has characteristic green colouring in its stem or cap at some stages in its development. Slimy waxcaps live up to their name and the caps of heath waxcaps can be quite sticky. 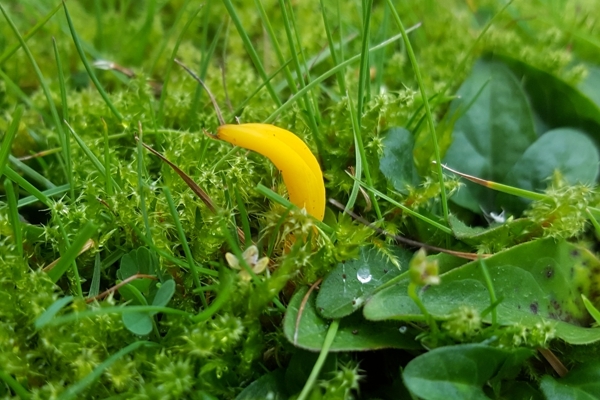 Amongst the grass, we found lots of bright yellow stems of a Clavulinopsis species. 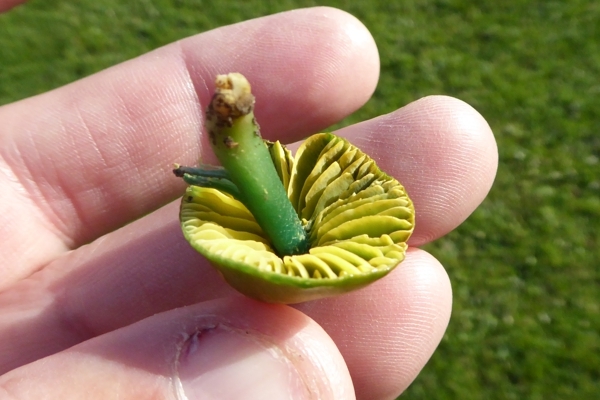 There are a number of these small yellow fungi and a microscope is needed to be able to name them with confidence. 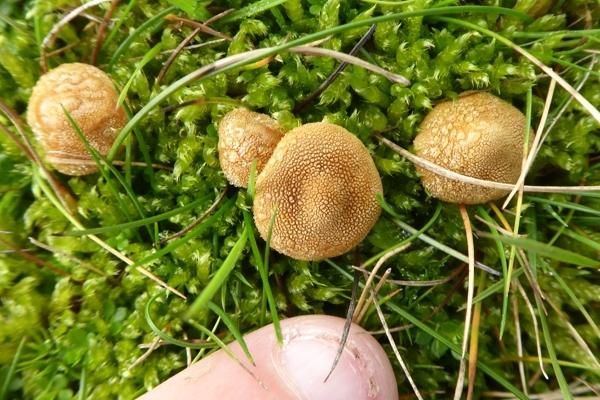 This tiny Cystoderma species is one to keep an eye on because it could be the host for an unusual and rare parasitic species of fungus called Squamanita paradoxa. 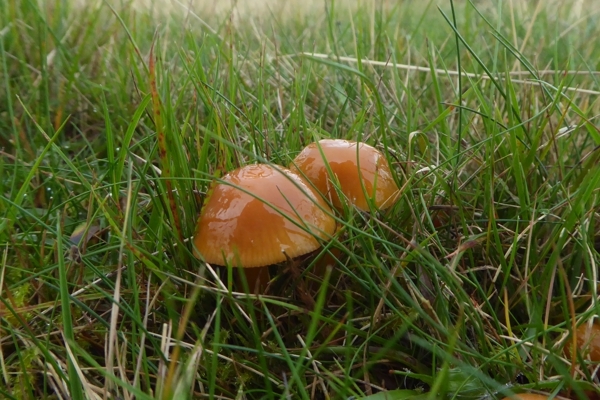 The dung left by the ponies which graze the common has provided a habitat for the egghead mottlegill mushrooms. These were one of the few little brown mushrooms that we could identify positively. 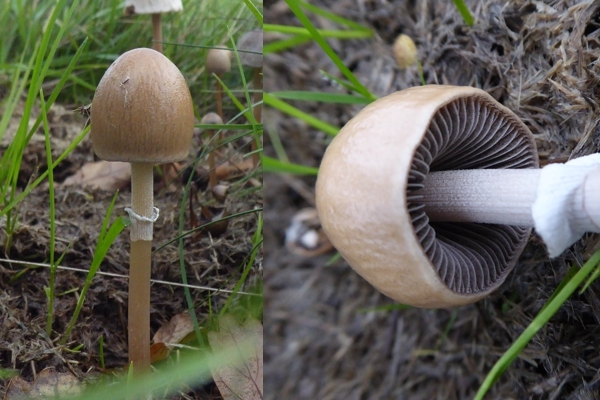 I couldn’t resist a second visit to the common today and I found a ring of field bewit – quite a distinctive fungus, with a brown cap and a pale violet stem.